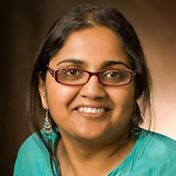 Anita Mannur, associate professor of English and Asian/Asian American Studies, is the 2019 recipient of the Excellence in Mentorship Award from the Association for Asian American Studies (AAAS). "The most meaningful thing about this award is that it comes from an organization I feel honored to be a part of, but also that it comes from my students," Mannur said. "I'm just so incredibly proud of all of their achievements and it brings me joy to think that I was able to make a difference in their lives." Mannur has been involved with AAAS for 20 years, serving as regional representative for the Midwest from 2009-2011. She values the support she received during the early stages of her career from senior colleagues in the organization. But she also remembers the difficult times for her as a graduate student and young academic. "I'm committed to mentoring because I care about the profession and I care about the people who are the future of the profession. We all do better when we feel valued and we feel heard. I did not always feel valued or heard during the early stages of my career and I strive to do my part to ensure that no one else feels that way." Mannur, a third generation teacher and second generation university professor, is familiar with the academic world and the privilege of that positionality, but also aware "that academia has its rules and idiosyncrasies and that some people–particularly first generation and students of color–don't know the unwritten rules. I am one of the few women of color who has 'made it' in this world and I strive wherever possible to share my experiences–positive and negative–to help others who don't know how to navigate this world." Guiding junior colleagues of color is one of the ways Mannur gives back. "I have served as an official mentor for a couple of people. Both of them are incredibly brilliant scholars and teachers from whom I've learned a lot and I care very much about making them feel that they are valued and can thrive both in the department and at Miami." But Mannur emphasizes that mentoring isn’t about cheerleading. The work is much more nuanced. "While I believe in uplifting students, I am also not the kind of person who will sugarcoat things for you," Mannur said. "I'm not interested in being popular but I am interested in seeing people succeed. I also know that mentoring is about asking the hard questions and not always about trying to be a friend." "I've been fortunate to work with some incredible undergraduate students, graduate students, VAPs and junior faculty at Miami. There are students who I worked with who are now teachers and professors working with their own students. Helping my students work towards their degrees, developing a professional portfolio for going on the job market but then also staying in touch with them after they land their first job is something I try to do, whenever possible."